PETERSON, CATHY, 62, of Palm Harbor, went Home to be with her Lord and Savior on August 19, 2013, after passing at Bay Care Alliant Hospital in Dunedin, FL. She was born in Birmingham, Alabama and moved to Palm Harbor, Florida in 1997 from Portsmouth, Virgina. Cathy and her husband, Pastor Joe Peterson, have been founding pastors at Christ Church of Palm Harbor, FL, for the past 16 years. Prior to taking that pastorate, Cathy served alongside her husband as evangelists. Pastor and Cathy traveled both across the nation and to many destinations around the world preaching the gospel and singing. She was gifted as a writer, poet, singer, song-writer, musician, a powerful witness, a strong pastors’ wife, an outstanding servant of her God, and perhaps one of the best organ players ever. She is going to be greatly missed by the many whose lives she has touched. She is survived by her loving husband, Joseph L. Peterson; her brother, David LeCompte; sister, Jennifer Evans; nephew, Josiah LeCompte; niece Elizabeth LeCompte; and countless spiritual sons and daughters throughout the world. A visitation will be held on Thursday, August 22, 2013, from 7-9PM, at Christ Church, located at 1111 Indiana Ave, Palm harbor, FL, 34683. On Friday, August 23, 2013, a visitation will be held at 10:00AM with a memorial service following at 11:00AM. Interment will follow at Trinity Memorial Gardens, 12609 Memorial Drive, Trinity, FL, 34655. I know Cathy is playing the Hammond organ for that heavenly choir. I will miss her singing, playing, shopping which we haven’t done in way to long & her bubbly personality. Joe, we are praying for Gods strength for you during this difficult time. God bless you Joe & Cathy, until we meet again my friend, you will be greatly missed! Love you both! We have been attending Christ Church for 10 months now.From our first visit Pastor Joe and Cathy were hospitable and gracious to us. They even took us out to lunch to get to know us..Cathy will be greatly missed and her smile will be in our hearts forever.Pastor Joe will be in our prayers always. Pastor Joe..You have been with so many of us when we have gone through similar times of grieving..and we want you to know we are always here for you..Not only as our Pastor, but as your friends and family. There will never be another lady like Cathy..Her very presence filled a room with Joy and Laughter..and her music and little “sermons” delighted everyone. Just to know her was to love her.. Some one gave me this saying when my loved one went to be with the Lord…”It is in dying that we receive ETERNAL LIFE”. Now Cathy is free and whole and has all the answers to ’how and why’ that we have wondered all our lives..When we see the bright stars in the sky, we will all be thinking of you are our loved ones that are there..and knowing you all are that light. Brother Joe,So sorry to hear about Sister Cathy, I didn’t know until I seen on Facebook ,and I didn’t even know she had been aoling . I do know she is with the LORD just as my Dad and Mother and alot of others. She has made it through Praise the Lord ! I still have Your and hers first Records and even Some 8track Tapes ,which are spiritual gold. You are in my prayers and I do really mean that ! So sorry to hear of Cathy’s passing. She was a wonderful lady who expressed the love of the Lord through her music. I will always remember the fun I had sewing and making her some outfits that she designed. Words cannot even express the ache that has been consuming our hearts since we lost such a precious friend. You are more than my friend Cathy, you are like my blood. The sister I always wanted. Since the first moment we all met at AG General Council in 1974 we knew the four of us would be friends for life. It is very rare that God brings such special friendships into ones life. Friends that laugh with you, cry with you, minister with you, and share and encourage your dreams. Don and I have so many wonderful memories of times spent with you and Joe. Memories from LA garmet district shopping trips to nearly getting arrested for J-walking in front of the police LOL. Cathy you were the one and only person who could shop for me and get the perfect size and outfit without me even being there! Heaven will surely be better dressed now that you are there. So as you play the Hammond organ and sing and prise in heaven, as only you can, know that we are missing you and loving you each and everyday. We are counting down the moments until we are together again. Heavens sounding sweeter all the time. We love you sweet and precious friend. P.S. Now I’m naming a rose after you. Very sorry to hear of Cathy’s passing. I know she will be dearly missed on this Earth. Sending lots of love & prayers that her husband, family & friends may find peace. Our hearts hurt today because we read in Times of Cathy’s passing. She was ONE special lady! The Lord’s comfort be with you during this sad time. dear pastor joe,john and i love you and cathy always.and we will remember forever our happy times.she is one of the most faithfilled women we have ever met.we pray for strenght,peace,love and guidance for you pastor joe.i enjoyed seeing her every week and her smiling face,while i was blessed to do her hair! !may the LORD BRING YOU PEACE..
Cathy will be so missed. She had a strong presence at christ church. An angel at the organ. loved her music. Love you cathy. Joe so sorry for your loss. Cathy was a wonderful lady. Always enjoyed her playing and you both singing at Portsmouth Assembly. Stay close to Jesus He will be your comfort. With lots of love from Timothy, Sarah, Faith and Isaac “Newton” Neo. We were blessed to have known her during our time in Florida. Along with her husband Joe, Cathy has been a powerful and lasting influence on our lives. We take comfort in knowing that she is home with Jesus and that we WILL see her again one day. Pastor Joe, you are in our thoughts and prayers. As I was working on the computer, I came across this entry and wondered if this could be the Joseph Peterson I knew from York, PA! As I read, I assumed it must be! How sorry I am to hear of your loss! Our prayers are with you and family and friends to whom this special lady meant so much! God is good; and I know He will comfort and sustain and bring peace that passes all understanding! Blessings and favor to you! 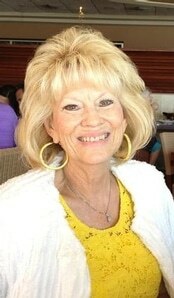 I was touched by Cathy Peterson’s kindness and generosity..She lived what she taught.. I know just how deeply you loved your wife. She was a good woman and a great servant of God. I am so truly sorry. Pastor Joe I truly know you are blessed I saw you on Frances and friends. I have not seen anything of you in years, good to know you are still preaching the true message of the cross. I know you loved your wife and she you. God bless you in your wonderful work for the Lord. I want to celebrate Cathy’s life with you. She truly was a servant of The Lord. Praise the Lord for this servant of the Lord and the life she gave to the Lord. Now she is with him praising as we all desire. Sorry I am late in giving my condolences. May you now rest in peace with the Lord. Happy that you are in a wonderful place now. Happy Days! With The Lord, Until We Meet on God’s Golden Shore. She is now waking on the Streets Of Gold!!! Can’t wait to meet her and may the Lord provide the strength for her husband and loved ones to endure. Today, I am celebrating my 45th spiritual birthday. I was saved on January 5, 1973 in a revival conducted by Evangelist Joe and Cathy Peterson at Lighthouse Tabernacle in Indianapolis, Indiana. Never in my life had I heard music like that in a church.It was a blessing to be able to see you all again in January of 2013 and express to you all my appreciation for the impact that you all had in my life. She was a wonderful and anointed woman of God and is now in the presence of the Lord Jesus Christ.